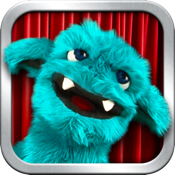 Lenord is a friendly, furry monster that responds to your touch or voice like a real pet. He repeats everything you say and loves to play games. You can tickle him, poke him, grab his ears or tease him. Record your own video messages of Lenord, save them to your library and send them as MMS, share them on Facebook or send them by email. - Talk to him and he'll repeat everything you say. - Tickle him and he'll start laughing. - Poke his belly or left ear and he'll start scratching. - Swipe his teeth and he'll start brushing. - Touch his face or anywhere around him but watch out, he bites! - Record video messages, save them to your library and send them as MMS, upload them to Facebook or send them by email. Visit http://furryfriendapp.com/buylenord and bring him home! - First pure video based game engine (no 3D!). - Highly interactive and responsive. IMPORTANT: On IPod touch, please remember to plug earphones with a microphone so Lenord can hear and repeat what you say. If you are experiencing any issues, please visit our site at http://furryfriendapp.com or contact us at support@furryfriendapp.com. We can't help you if we don't hear from you!